The inspiration for this recipe comes from a Facebook post by Judy Witts Francini. You can find her Kindle book, Secrets From My Tuscan Kitchen on Amazon, a veritable treasure trove of Tuscan recipes. 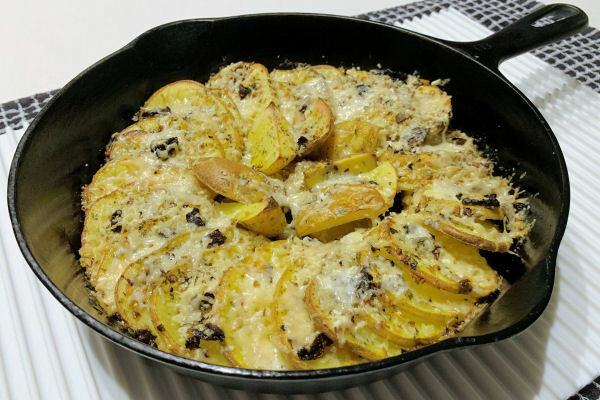 You can make these potatoes in your kitchen oven or in your kamado-style cooker. Preheat your oven/kamado cooker to 450° F. If using a kamado-style cooker, set it up for an indirect cook using a heat deflector. Spray the skillet with some olive oil, or wipe the skillet with an olive oil-soaked paper towel. Cut the ends off of the potatoes and cut the ends in half crosswise. Use a mandoline or a knife to slice the potatoes about 3/16" thick, or as thick as you prefer. Arrange the potatoes around the outside edge of the skillet as shown in the photo. Place the cut ends in the center. Give the potatoes a quick spray with olive oil or drizzle some olive oil onto the potatoes. Sprinkle a generous amount of Rustic Italiano spice mix on the potatoes. Place in your cooker for 40 minutes. Remove the pan from your cooker and sprinkle some panko bread crumbs and grated Parmigiano-Reggiano cheese over the top of the potatoes. Scatter small blobs of butter over the top of the potatoes. Return the pan to the cooker for 5 more minutes. We used a Griswold #6 skillet which is about 7½ inches across the bottom. Rustic Italiano spice mix can be found primarily in Fresh Market shops around the country. You can visit the Instant Gourmet web site at www.instantgourmetspices.com to locate other sources or order it direct from their web site. And you can also order Rustic Italiano Seasoning from Amazon.